Would you like to learn to paint and draw faces? Drawing in the Soul is a complete & in-depth online art course in which you’ll learn step by step how to draw and paint female portraits. It is one of my most popular classes and taken by over 500 people. The next session of this class starts June 3 and runs for 12 weeks. Going on holiday or have other obligations during the class? No worries. We all start on the same date, but you can follow all lessons in your own pace and at your preferred time. 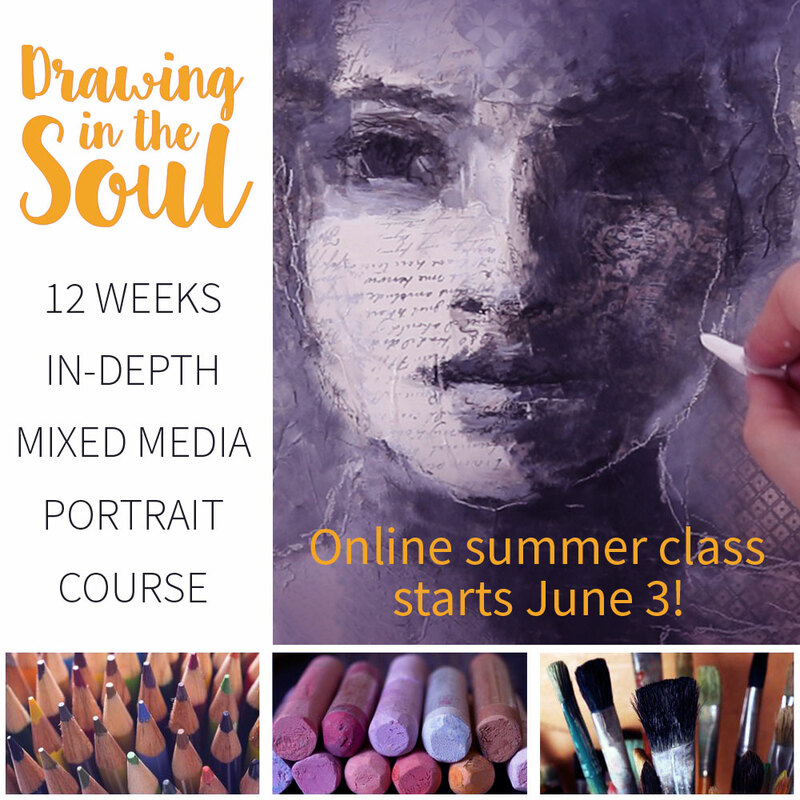 Drawing in the Soul is an in-depth 12-weeks class, which starts from the fundamentals and then builds up to more advanced levels. 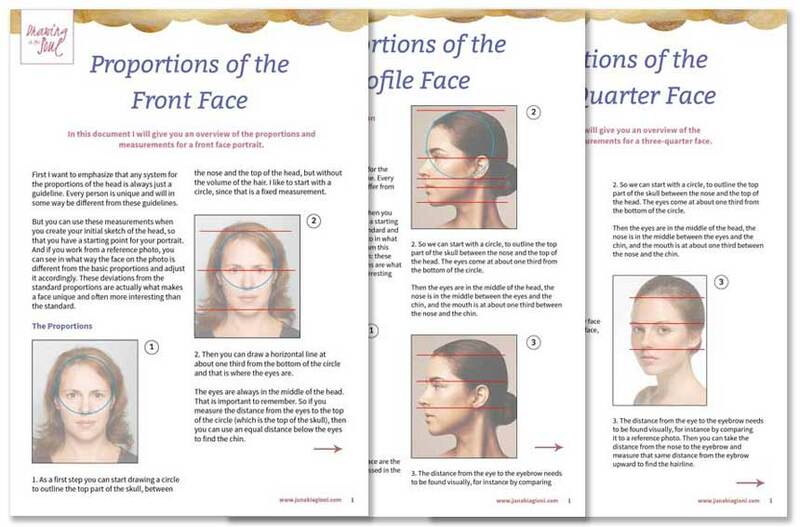 You’ll learn about the proportions of a front face, profile face, and three-quarter face. You will learn about fundamental art concepts like tonal value, line, and color, which are important for creating portraits. 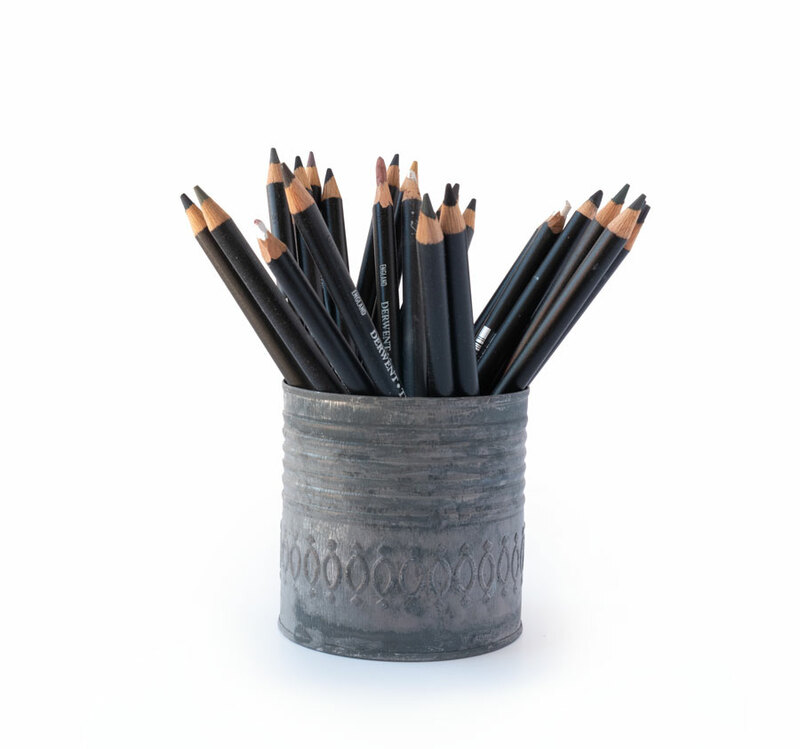 You’ll work with supplies like acrylic paint, charcoal, pastels, collage, and more. And you’ll learn ways to create focal points in your portraits, to help guide the viewer’s eye and to give your portraits more depth and interest. Click the dots below to read more. I am not just teaching you how to create my style of portraits, but show you in detail the techniques that I use and why I use them, so that you will be able to incorporate them into your own style. 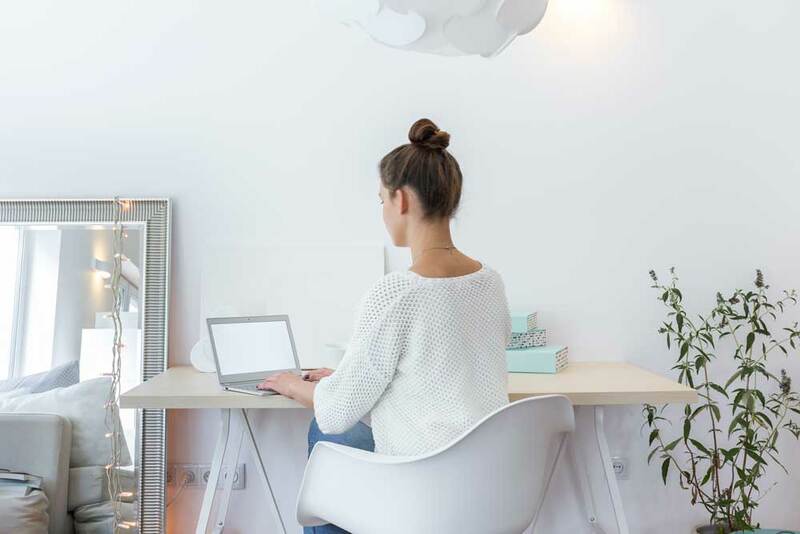 This online course offers the advantage of being able to follow the lessons from the comfort of your home. You get lifetime access to the course website, and you can download all materials, so you can watch the videos and read the written lessons as many times as you like. 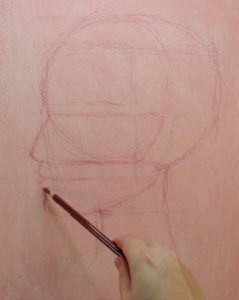 We’ll start with the fundamentals and learn about the classical face proportions, basic shading, and facial features. This will be explained for all three basic head directions that we’ll cover: front face, profile face, and three-quarter face. You’ll practice drawing the initial sketch of the head using the classical proportions, and learn how to create the basic shading for each face direction. I’ll also show you how I draw the facial features, such as the eyes, nose, and mouth. Important topics in this course are value, line, and color. You will learn how you can use value, line, and color in various ways to create different styles and make your portraits more interesting. The term ‘value’ (or tonal value) in art refers to how light or dark a color is. Learning to see values and to work with them is key in creating portraits. With values you create the structure of a face and give it depth, or a 3D effect. Line is a very important element in art and there are many ways to use it. In this course you’ll learn for instance how to use line to create values, but also how you can work with line to create texture, to indicate shapes, and to add decorative elements to your portraits. In this course you’ll get basic color theory, which you can use to create beautiful and interesting color combinations in your portraits. 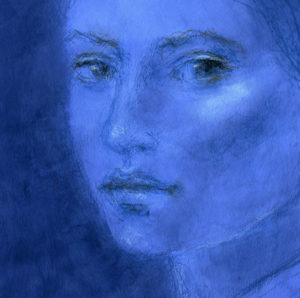 You’ll also learn how value and color are related and how you can use color to create more depth in your portraits. This video gives an impression of one of the bonus lessons in Drawing in the Soul, in which we’re going to create a mixed media portrait focusing on the use of tonal value. After we’ve learned to create faces in various directions, working with value, line and color, and using different techniques and supplies, we’re going to utilize that knowledge and take it one step further. How can we give our portraits more depth and ‘soul’? How can we draw the viewer’s attention to specific areas of the portrait that we feel are expressing this soul, or that are telling a certain story? That will be the focus of the final three weeks of Drawing in the Soul. 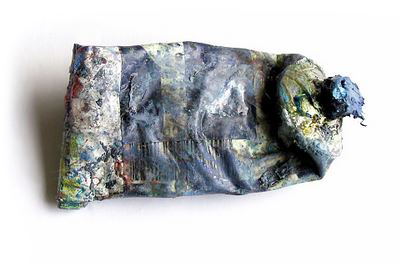 This course is intended for artists & creatives of all levels. Both beginners, but also for more advanced artists who are interested in specific topics that this course covers, or if you want to see and experience my way of working. If you are new to creating portraits, you will learn all the basic techniques for creating front faces, profile portraits, and 3/4 faces. You’ll also learn how to work with the specific supplies. All you need is a little (very basic) experience with acrylic paint. The rest will be explained and demonstrated in the lessons. If you already have some experience in making portraits and want to learn more about the topics of value, line, and color, then you can delve into these subjects. 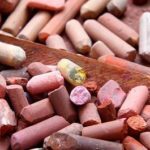 And if you want to practice working with specific supplies like soft pastels, charcoal, and oil pastels, then you can learn how these materials can be used. Drawing in the Soul is also suited if you are already more experienced and skilled in creating portraits, but want to learn more about my portrait style. You will be able to follow me step by step and see all the techniques and supplies that I use in my art. Sometimes you can get stuck and you don’t know what is going wrong or you can’t see where you could change things. It’s hard to figure this out all on your own. That’s when feedback from the teacher can be an essential support to help you get past these obstacles. During the 12 weeks of Drawing in the Soul I am available to give feedback on your work, when needed. Providing feedback is something I take very seriously. I’m available to answer any questions or doubts you might have, and sometimes I will illustrate my observations with clear visual images. 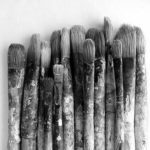 This can really help you in your artistic development and is not only helpful for yourself, but also for the rest of the group. That’s why I provide this type of feedback and support only in the Facebook group for Drawing in the Soul, so that all students can learn from each other. 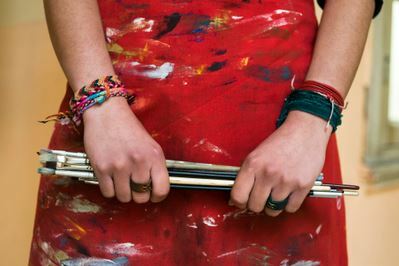 The course consists of 4 modules: Value, Line, Color, and The Soul. While the last module has its own format, modules 1-3 will follow the same structure and build upon the topics of the previous modules. Each module takes three weeks. Every first week of modules 1-3 you will get a video introduction that explains the topic of the module. We will also do several exercises that will focus on individual aspects of the subject of that module. Sometimes you will also get one or more text-only lessons, that will explain some additional theory or provide background information. In the second week we’re going to make the main project for that module. We’re going to create a portrait from start to finish: from the sketching phase to the final little details. We’ll take all the elements that we’ve learned in the first week and bring those into practice in one large project. Since the first two weeks of each module are intense and filled with exercises and lessons, in the third week we will get time to practice what we’ve learned so far, and do some catching up if necessary. For those of you who would nonetheless like to have new materials, there is a fun & shorter bonus lesson available. In Module 4 we’re going to use what we’ve learned in the previous modules and take that to a higher level. In this module we’re going to explore ways to draw the viewer to our portrait and to bring the focus on that something extra, what I would call ‘soul’, in our portrait. Each week of this module you will get one ore more text-only lessons and we will create one project from start to finish. The lessons in Drawing in the Soul are presented in the form of text lessons and over 30 hours of video lessons. 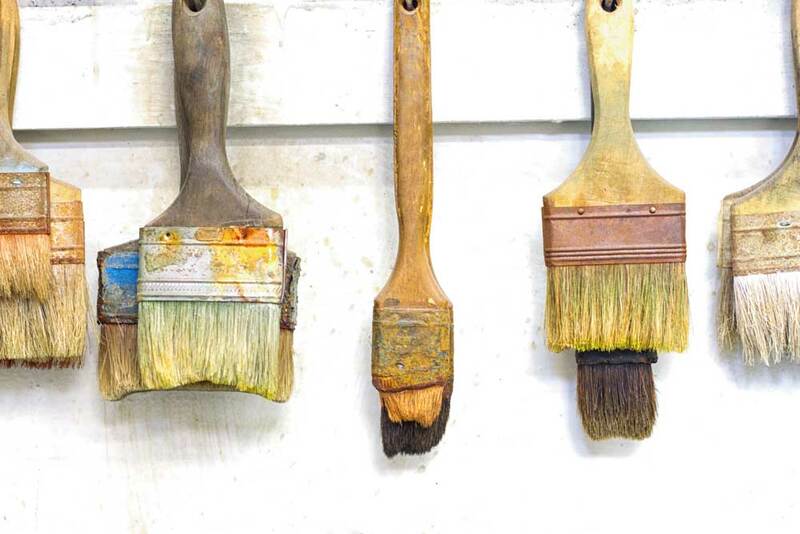 You’ll get background theory and hands-on painting and drawing lessons. The course is carefully structured and all lessons build upon each other. 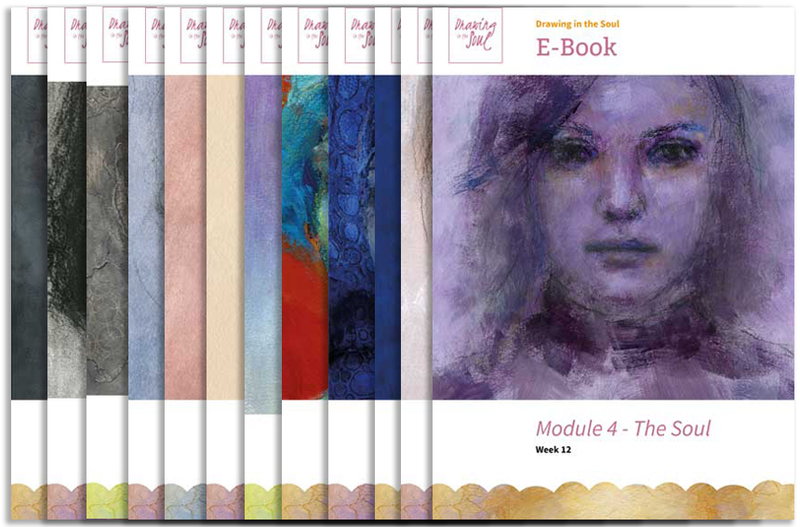 The lessons with art theory and background information are sometimes provided as reading texts and other times in the form of video introductions. Other lessons in this category are the art supplies videos, in which I give background information on the supplies that we’ll be working with and show you how to use them. The exercises are always presented in the form of video lessons. In the exercises we practice one or more specific aspects or techniques, so that the information is broken down into smaller segments which makes it easier to learn and to practice. And finally, when we’ve learned about the theory and practiced the techniques in the exercises, it’s time to apply this into a larger project. Projects are video lessons in which we’re going to create a portrait from start to finish: from the sketching phase to the final little details. In this course we’re going to do six of these larger projects. You receive 30 hours of detailed video lessons, recorded in real-time (no speeding up). 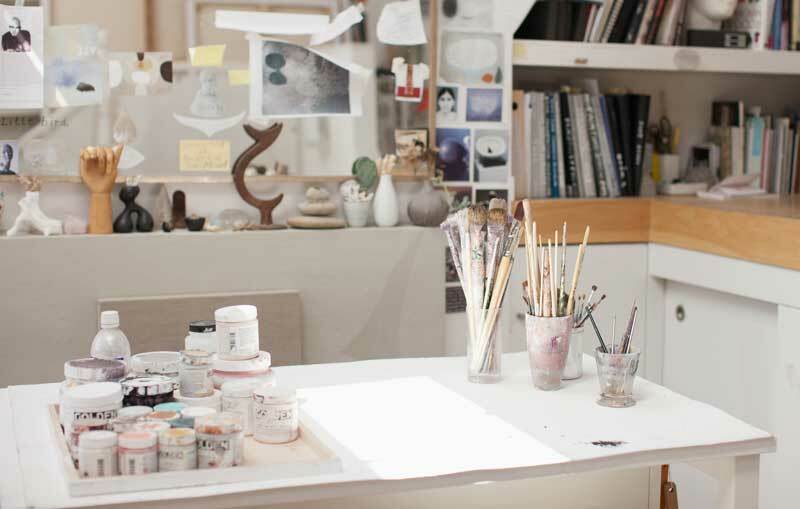 Most lessons are filmed with two cameras, so that you can see exactly what I do – not only on the easel but also what is happening on my table, for instance how I mix my paint. Every week you receive a so-called E-book. This is an interactive PDF that contains the texts of the lessons, descriptions of the videos, images, and clickable links to that week’s videos. You can download all 12 E-books (166 pages in total! ), so that you can easily refer back to them and if desired print them out. Besides the twelve E-books you also receive additional course materials in the form of PDF documents, such as reference sheets with information about face proportions (mapping), weekly supply lists, and the reference photos that I have been using in the video lessons. You get lifetime access to the course website and all course materials, such as the videos, E-books, and additional course materials, can be downloaded and are yours to keep forever. For ‘real-life’ interaction with me and your fellow students, you can join the private Facebook group for the class. Here you can ask questions, get feedback & support, and socialize through the safe environment of the class community. 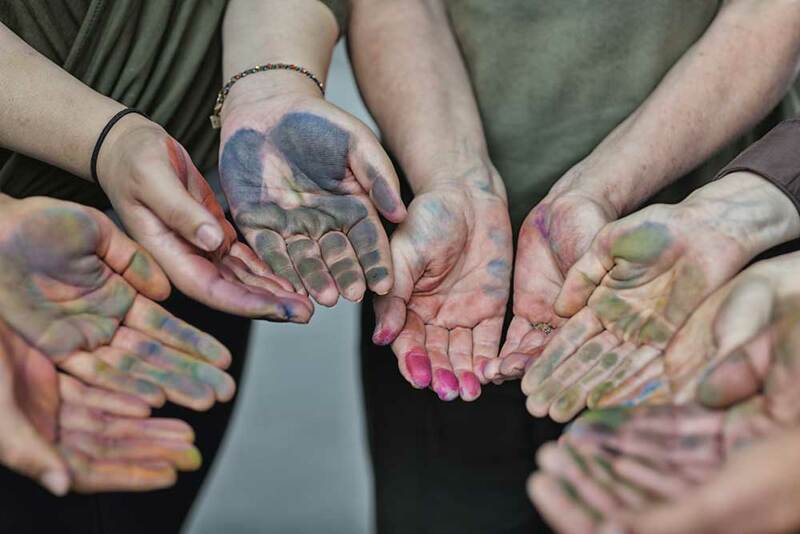 The participants of Drawing in the Soul come from all walks of life and from all over the world. Joining the Facebook group is a great way to meet new people and make friends who are interested in art, like you. Thirty hours of video lessons, recorded in HD and in real-time. You can download all the videos, so you can do the lessons any time and keep them forever. 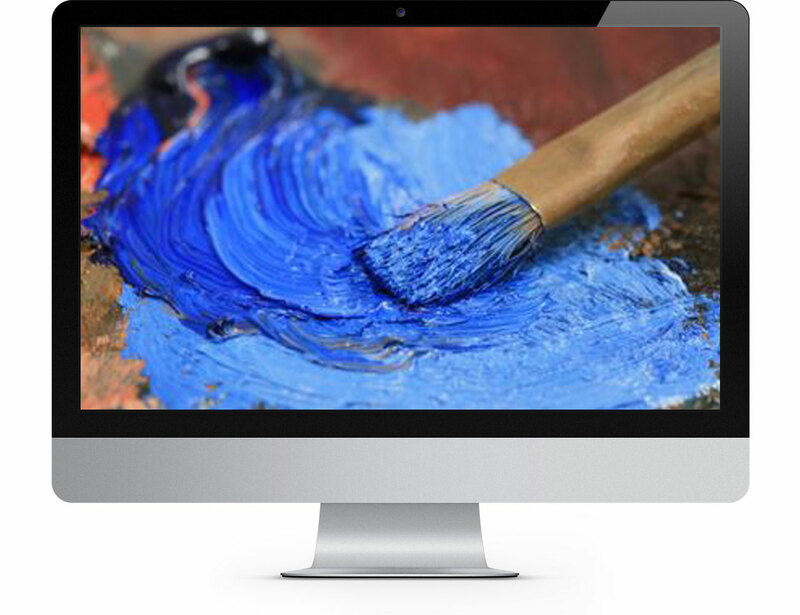 Life-time access to the course website, so you can do the lessons in your own pace. Twelve downloadable E-books with the texts of the lessons, which can be downloaded and kept for future reference. Additional course materials such as weekly supply lists, info sheets, and reference photos. Can be downloaded for future reference. Access to the Drawing in the Soul Facebook group, where you can show your work, get feedback & support, and connect with other students. 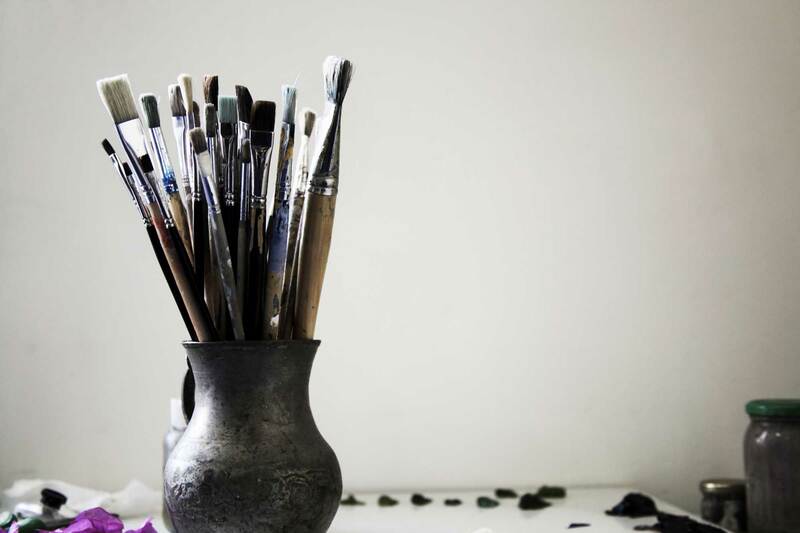 We’ll use a variety of art supplies, such as acrylic paint, charcoal, soft pastel, hard pastel, pastel pencils, collage papers, and a little bit of oil paint sticks & oil pastels. You will get extensive background information on the supplies that we’ll be working with. In the video lessons I’ll show you what you can do with the supplies, so you can practice how to use them. 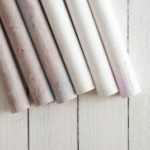 Would you like to know which supplies we’ll be using? Download here the full supply list for the course. Prices in Euro will be used for the actual purchase. Do you want to stay updated on this class and receive an email when the registration opens? Just fill in the form below and I’ll keep you posted. Lifetime access, what does that mean in practice? You get lifetime access to the course. In practice this means that the Drawing in the Soul website (including all lessons, materials, and videos) will remain accessible to you for as long as Drawing in the Soul is being offered for sale. If Drawing in the Soul at some point in the future isn’t ging to be offered for sale anymore, you will have 6 months to download all materials if you want to keep them forever. After signing up, do I get access to the lessons right away? After signing up, you directly get access to the introduction section of the class. There you can get familiar with the course setup, watch a welcome video, read general information, download the supply list, and more. As soon as the class starts, on Monday June 3, you get access to new lessons each week during the a 12-weeks of the course. The video lessons are prerecorded, so you don’t have to be present at a specific time but you can watch them whenever it suits you, at your own pace and in your own time. This is a ‘live class’. What does that mean in practice? This is a live online class, which means that the class opens at a particular date (in this case June 3, 2019) and we will start with all the students at this date. The lessons are released weekly, during 12 weeks. However, you don’t have to follow the twelve weeks schedule. The video lessons are pre-recorded, so there is no specific airing time and after release you can watch them whenever it suits you best. You have lifetime access to the course website and can do the lessons comfortably at your own pace, so no worries if you can’t keep up with the course schedule! Do I have to be available at a specific time to watch the video lessons? No. Although this is called a ‘live class’, you don’t have to be present at a specific time to watch the video lessons. The videos are pre-recorded, so there is no specific airing time and after release you can watch them whenever it suits you best. Can I download the videos and course materials? Yes, you can download all the videos and course materials (E-books, supply lists, info sheets, and reference photos). Make sure you have enough free disk space (an external disk drive or usb stick is recommended), because there is in total 30 hours of video available! Can I get feedback from you on my work? Yes, during the 12 weeks that the class is running, I am available to give feedback on your work if requested. Sometimes this feedback will be in written form, sometimes the feedback will be illustrated with visual images. This feedback is not only helpful for the student who’s work is being reviewed, but for all students. That’s why it will only be given in the Facebook group, so that everyone can learn from it. Will you give feedback on all my work? During the 12 weeks that the class is running, I am available to give feedback on your work that you made for the lessons of this class. I can’t give feedback on work that is not made for this class. I will not always give feedback, only if you request it or if I think it may be useful. Sometimes this feedback will be in written form, sometimes the feedback will be illustrated with visual images. I am a total beginner without any art experience. Can I sign up? Yes, you can definitely sign up for the course. All you need is a little (very basic) experience with acrylic paint. The rest will be explained and demonstrated in the lessons. And you can always ask questions and get support in the Facebook group. I feel a bit insecure about my art and not ready to show it to others. Can I participate without joining the Facebook group? I don't have a Facebook account. Do I need one in order to do the course? You don’t necessarily need a Facebook account to follow the course. The course website is a dedicated website that you get access to after you sign up for the course. The Facebook group is optional. However, if you do want to join the Facebook group but don’t have a Facebook account (yet), you can also consider creating a Facebook account just for this course alone. Do you work with reference photos during the course? Yes, we will be working with reference photos during the course. The goal is not to create an exact likeness of the portrait on the photo, but to use the photo as a reference and inspiration for things like shading and proportions. The photos that I will use in the lessons will be available for download, but of course you can also use your own photos if you prefer. Is there a payment plan for this course available? Yes, there is a payment plan available to pay in installments. For more info on the conditions, please contact me via the contact form below. Click here to read the practical information before purchasing the course. Once you have purchased your course, you return to a confirmation page with an overview of your registered courses. When you click on a course you should be already logged-in to the course site and have immediate access to the classroom. If at any time you need to login to the site, you will need your username (the email address that you used to sign up for the course) and the password which you chose when you signed up. With your username and passwordyou can always access your courses by clicking on ‘My Classroom’ at the top of this website. This course will be presented online, so you need a web browser. I recommend Chrome or Firefox. Make sure your browser is updated to the latest version. You will get the best results if you use a laptop or computer. You can use smaller devices (like a tablet) as well, but then the layout may change slightly. If you want to download the videos, you need space on the hard drive of your computer, or an external storage like an external hard drive or a USB stick. A high-speed internet connection to be able to download the videos or watch them online. A basic understanding of IT, like reading emails, watching videos online, reading PDF documents, and navigating websites like Facebook. If you’re having trouble with some IT related stuff some help can be given, but in-depth IT guidance cannot be given.